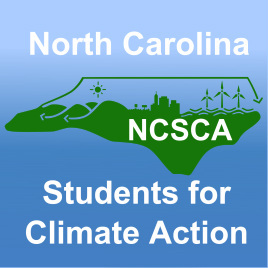 Join NCSCA at Historic Thousands on Jones Street on February 8th as we march for action on climate change! Marchers will meet at Shaw University on South St. between Wilmington St. and Blount St. at 9:30 AM in downtown Raleigh. The march to Jones Street will begin at 10:30 AM after which a mass people's assembly on the doorstep of the NC General Assembly will begin. Most of our interactions occur on Facebook. Check out our Facebook page here.